Everyone Welcome! No Registration Necessary. Join in at anytime! 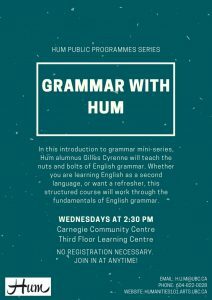 In this introduction to grammar mini-series, Hum alumnus Gilles Cyrenne will teach the nuts and bolts of English grammar. Whether you are learning English as a second language, or want a refresher, this structured course will work through the fundamentals of English grammar.